John and Joanne Anderson have owned hairdressing salons for over 27 years. Created in 1989 with a small team in Newcastle City Centre they grew to over 40 team members and two successful salons. A change in direction brought them to Hexham and this year they will celebrate 10 years. 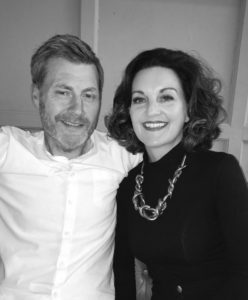 John and Joanne’s ethos has always been about providing a happy environment to grow a happy team and commitment to their clients. We like to offer a face to face consultation to discuss face shape and lifestyle of every client. We listen and understand the needs and requirements to deliver a haircut that suits every individual so they can look after after it at home. We aim to recommend a prescriptive product plan unique to every client with the emphasis on recommend rather than sell. We offer a bespoke Bridal Service and recommend a free consultation to discuss requirements. We can travel to venues but for it to be more cost effective for the bride we recommend an in salon service. This can all be discussed at consultation. Special occasion hair is also available within the salon. 100 Days of smooth is an ideal treatment for managing and controlling frizz or unruly hair. This product is completely chemical free and will not permanently straighten the hair. The idea is to make it more manageable, even out the porocity of the hair and to improve the condition. Includes cleanser and conditioner maintenance products to use at home. We offer a couture colour service to suit every client. Foiling, permanent and semi-permanent colour, lightening, fashion and colour correction. We use Wella Professional colouring system and System Professional aftercare products to maintain the colour. A System Professional Colorlock emulsion is included in every service. We offer a Permanent Waving service to include both classic and fashion waving techniques. Wella System Professional Permlock emulsion is included in this service.